STICKY SIRNA is a new class of interfering RNAs designed to dramatically enhance siRNA-mediated gene silencing in vivo. The stability and bioavailability of classical siRNA duplexes as well as the amount of dsRNA delivered to cells remain the limiting factors for efficient silencing. 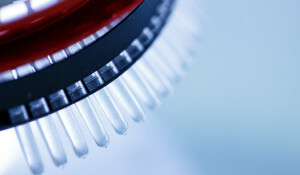 We have developed STICKY SIRNA which has a high RNA interference activity in eukaryotic cells and provides higher gene silencing efficiencies than those obtained using conventional siRNA, when introduced with the same delivery system. This was achieved by oligomerizing siRNAs by the addition of short “sticky” overhangs which significantly increases the siRNA and formulation stability, in vivo delivery, RNase protection and gene silencing without inducing pro-inflammatory cytokine responses. Therapeutic STICKY SIRNAs inhibiting tumor cell growth or inducing apoptosis have been successfully tested in vivo in lung metastatic cancer, melanoma xenograft and prostate cancer models (results published) and can be combined with chemotherapy treatments. 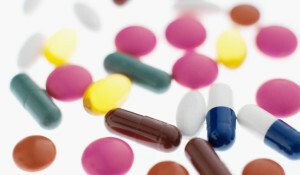 Proven preclinical efficacy data and safety studies in mice have produced highly encouraging results supporting the track towards future drug candidates entering clinical development. STICKY SIRNA is a new class of interfering RNAs. A short complementary (dA)n/(dT)n is added at the 3’ overhang ends (sticky ends) of short double-stranded RNA enabling a self-oligomerization of such RNAs (Bolcato et al., 2007). The addition of these short “sticky” overhangs significantly increases the in vivo stability of siRNA/delivery reagent complexes, particularly when in vivo-jetPEI® is used as the delivery reagent, and hence also increases RNase protection and gene silencing. Fig. 1: Schematic structure of STICKY SIRNA. What are the properties of STICKY SIRNA? Effective delivery is recognized as being the major unsolved problem in RNA interference-based therapeutic approaches. siRNAs form unstable complexes with most of the cationic delivery vectors, which leads to reduced transfection efficiency and consequently lower gene silencing effects. STICKY SIRNA was proposed to solve these issues. 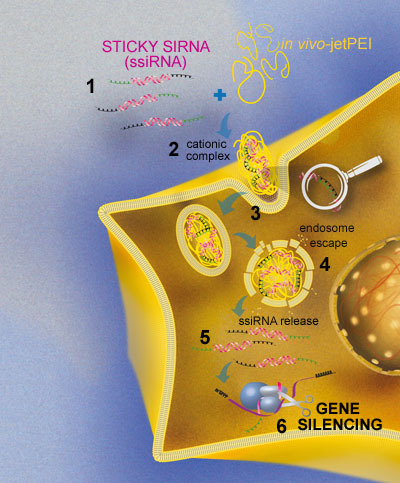 The concept of the STICKY SIRNA technology is summarized in the following figure. Fig. 2: STICKY SIRNA technology. STICKY SIRNAs are mixed with in vivo-jetPEI®, a cationic polymer and delivery vector, to promote the RNA oligomerization and complexation process. Consequently, very stable cationic STICKY SIRNA/ in vivo-jetPEI® nanoparticles (<100 nm diameter) are formed protecting siRNA from degradation. These cationic complexes penetrate cell membrane via endocytosis. The endosomolytic activity associated with in vivo-jetPEI® induces both the disassembly of nanoparticles and the release of STICKY SIRNAs in the cytoplasm. STICKY SIRNAs are then de-oligomerized in the cytoplasm and loaded into RISC, where specific silencing of the target is achieved. The main steps leading to gene silencing are presented in the following figure. Fig. 3: STICKY SIRNA delivery mechanism. Manufacturing in compliance with GMP in place for both components (STICKY SIRNA and in vivo-jetPEI®). STICKY SIRNA/ in vivo-jetPEI® nano-particles were shown to be efficient to deliver siRNA in many organs (lung, liver, brain, …) as well as tumors and metastases (Bonnet et al., 2013). As proof of concept, many tumor models were developed by Polyplus-transfection® targeting proteins controlling the cell cycle (cyclin B1) or anti-apoptotic protein (survivin). STICKY SIRNA was shown to be efficient at low dose (about 1 mg/kg), through a specific RNAi mechanism that was proven in sub-cutaneous xenograft murine melanoma model (Kedinger et al., 2013). STICKY SIRNA was shown to be promising therapeutic candidates in very aggressive lung metastasis models (mammary adenocarcinoma and melanoma) and disseminated prostate cancer model. In addition, STICKY SIRNA showed a strong synergy effect when combined with classical chemotherapy such as cis-platin or doxorubicin (Bonnet et al., 2013; Kedinger et al., 2013). As STICKY SIRNA/ in vivo-jetPEI® nanoparticles are able to deliver siRNA in many organs (lung, liver, brain, …), many applications are possible such as viral infection therapy (hepatitis in liver, Influenza infection in lung), acute lung injury, metabolic diseases or asthma. Recently, STICKY SIRNA was used with success in an experimental treatment of osteoporosis (Capulli et al., 2015). Bolcato-Bellemin, A. L. (2007) Sticky overhangs enhance siRNA-mediated gene silencing. Proc Natl Acad Sci U S A 104, 16050-16055. Bonnet, M. E., (2008) Systemic delivery of DNA or siRNA mediated by linear polyethylenimine (L-PEI) does not Induce an inflammatory response. Pharm Res, (12):2972-82. Bonnet, M. E., (2013) Systemic delivery of sticky siRNAs targeting the cell cycle for lung tumor metastasis inhibition. J Control Release 10; 170(2):183-90. Kedinger, V., (2013) Sticky siRNAs targeting survivin and cyclin B1 exert an antitumoral effect on melanoma subcutaneous xenografts and lung metastases. BMC Cancer., 13(1):338. Capulli, M. (2015) Effective Small Interfering RNA Therapy to Treat CLCN7-dependent Autosomal Dominant Osteopetrosis Type 2. Molecular Therapy—Nucleic Acids 4, e248. STICKY SIRNA is the subject matter of US Patent No 8,802,640, European Patent No. 1 888 749 and foreign equivalents entitled “Oligonucleotides for RNA Interference and biological applications thereof”. For licensing opportunities, please visit our webpage dedicated to Licensing Opportunities. For research use, STICKY SIRNA can be produced by oligonucleotide manufacturers as custom RNA-DNA oligonucleotides. Please contact us. 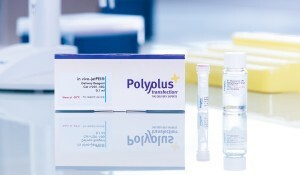 in vivo-jetPEI® is available from Polyplus-transfection®.